Kitsuki"- Little Kyoto" SUBPAGE | All Japan Kyoto Association"
Kitsuki, a little Kyoto in Kyushu, is located at the southern gateway of the Kunisaki Peninsula. Kitsuki is a scenic castle town with many slopes overlooking the beautiful Morie Bay, famous as a habitat of horseshoe crabs. 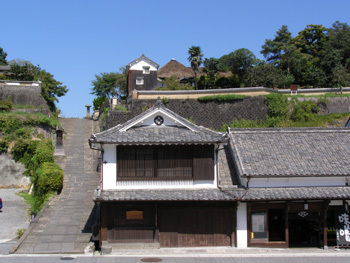 In the Edo period (17-19th century), Kitsuki prospered as a castle town governed by the Matsudaira Family and many samurai residences and earthen walls, stone pavement and slopes still remain from those days. The landscape of Kitsuki exhibits interesting characteristics that illustrate the class systems in those days: samurai classes lived in the north and south area on the hill and the merchant class lived in the valley situated between those hills. This kind of “Sandwich-shaped” castle town with a ribbed landscape is very unusual in Japan and Kitsuki is regarded as the only city to have such characteristics in Japan. 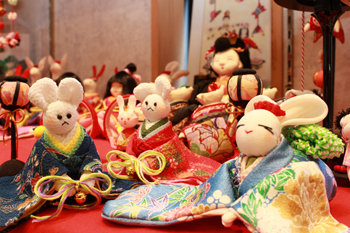 Kitsuki was designated as the first city in Japan as a “Traditional Landscape Town where Kimono Matches”. Visit Kitsuki where time goes slowly and one can enjoy the serene sea breeze of the Setouchi Inland Sea. 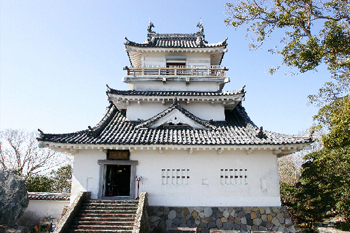 The castle is a symbol of the castle town with its slope. Superb views can be enjoyed from the castle tower. 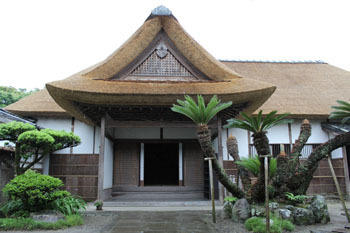 This is a high-class samurai residence situated in Kitadai (north side) and its highlights are the garden and dignified thatched-roof. 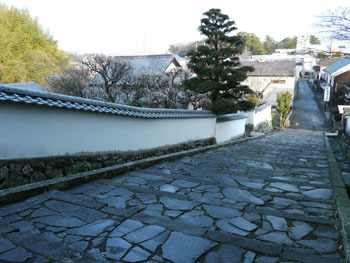 This is one of the major well known slopes in Kitsuki with a beautiful earthen wall and stone pavement. 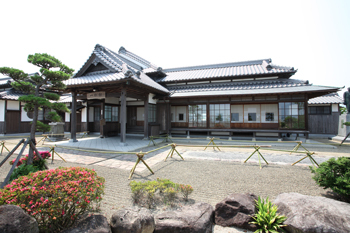 A miniature model of Kitsuki castle town and important historical documents from the former feudal domain era are displayed. This shrine was built in 985 after transferring the deity from Iwashimizu Hachiman-gu Shrine located in Kyoto’s Otokoyama. 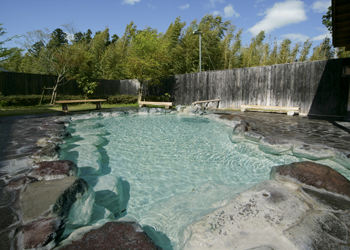 The hot spring water here helps to make one’s skin beautiful. The high-quality spring is the secret of its popularity. 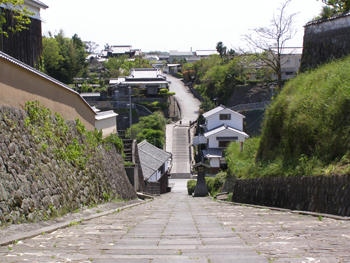 These are Kitsuki’s major slopes which connect the samurai residences in Kitadai and the town of the merchants. Kitsuki’s No. 1 stunning view spot! Enjoy discovering this sumptuous Japanese residence which was built with superb techniques from the 1930’s. It will make for a pleasurable time for visitors to stroll around the old castle town with many slopes and visiting samurai residences and traditional Hina doll displays. 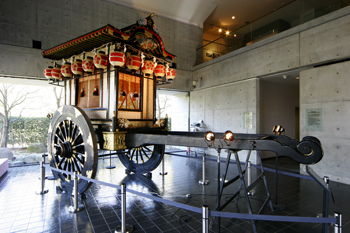 Enjoy a nostalgic moment by learning about the lifestyle of the samurai class and merchants in olden days. This is a traditional ritual to pray for a rich autumn harvest and family prosperity. Performer’s humorous acting brings laughter to audiences. Atmosphere from the Edo period (17-19 century) is recreated with costumes from Uzumasa studio in Kyoto. The Oiran Dochu (high-class geisha) parade is a must see. 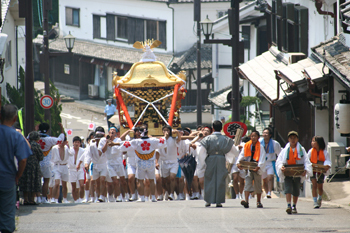 Centered on mikoshi portable shrines, dashi and danjiri floats parade around the city. It is a dynamic festival with more than 300 years of history. 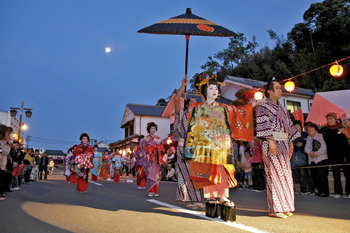 This is Kitsuki’s popular summer festival. 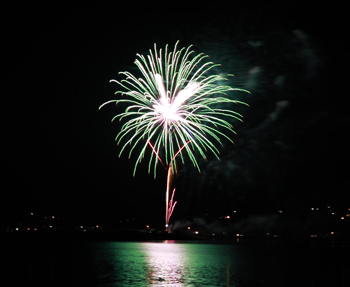 Some 4,000 fireworks will be set off and illuminate the night sky beautifully. Children wearing skirts made of straw and straw sandals, lift nobori flags on their shoulders and dance while beating drums hanging on their chests. 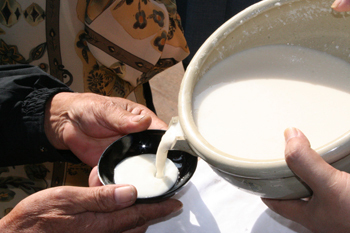 Special kinds of Doburoku (unfiltered cloudy sake) which only a few breweries are permitted to brew, will be offered. The festival began in 710. This pottery’s glaze is made using wooden cinders of the orange tree and tea tree from Kitsuki. The pottery has an earthy feeling. Kitsuki’s sole swordsmith makes great handmade knives. Hinoki Japanese cypress wood is bent and attached to cherry tree bark, then made into steamers, sifters and other kitchen tools. This traditional technique has been inherited here only in Kyushu. 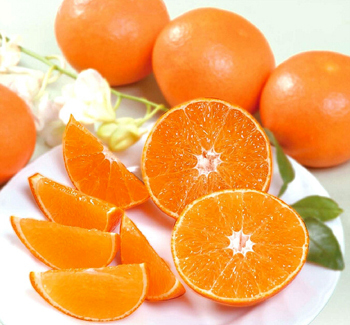 Setouchi’s fine oranges capture the perfect balance between sweet and sour and are cultivated in greenhouses in the mild weather of the Setouchi Inland Sea area. 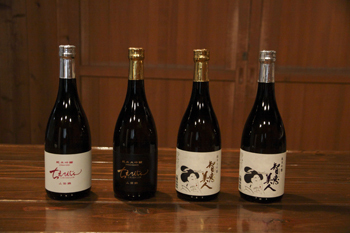 Kitsuki has brewed local sake since the olden days. 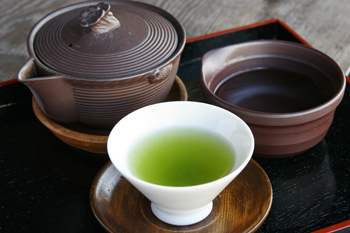 “Chie Bijin” is made using pure natural water and brewed in the traditional old way by hand. 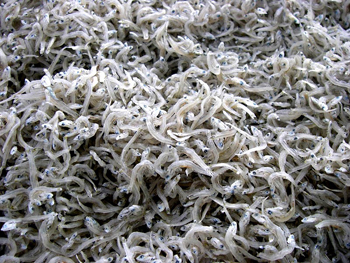 Chirimen is the name given to whitebait after it is first boiled then dried. 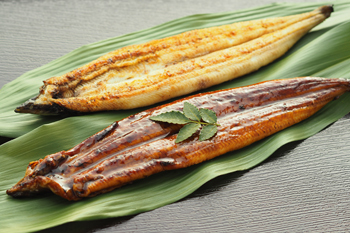 Chirimen in Beppu Bay is becoming popular as a gourmet food and it accounts for 80% of chirimen produced within Oita Prefecture. 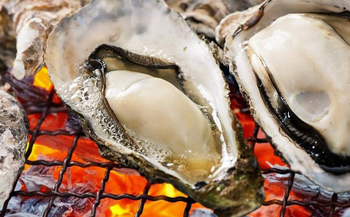 Oysters grown at nutrient-rich Morie Bay are called “Sea Milk” and make an ideal nutritional food. The tea leaves of Kitsuki are washed right after picking and then processed. 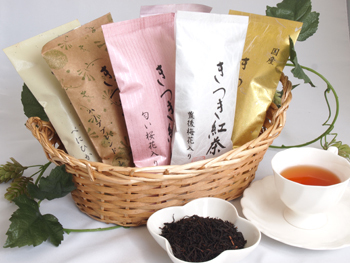 Kitsuki tea is sweet and full-bodied. 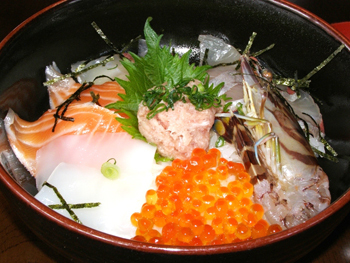 Blessed with mountains and sea food, Kitsuki is a treasure house of food. Kitsuki’s original Do-nto Donburi rice bowl and sandwich are a popular gourmet menu. Kitsuki is one of the few domestic black tea production areas in Japan. This superb tea has a fine aroma and color.